And Pencils! When you want to add color to your Zentangle-inspired art, water-based ink is a great way to go. And SO much fun! Sandy Bartholomew gives these Derwent Ink Pencils a high recommendation. Amazon artist reviewers are unanimous in giving them 5-stars. From a review: “Derwent Inktense combines the brilliant intensity of pen and ink with the versatility of line and wash. Apply pure vibrant dry color and then wash out with water to leave a translucent ink-like effect. Once dry the color is permanent and can be worked over with other media – wet or dry. The possibilities are endless; the results stunning! These ever-popular double-headed, flexible nylon fiber brush pens have a single ink reservoir and two tips: one brush tip and one fine tip. The water-based ink is acid-free, non-toxic and blendable, allowing an endless palette of colors. It has the convenience of a flexible brush and a fine tip in one pen. High-quality, resilient brush retains its point stroke after stroke. Non-toxic, acid-free, odor-less and nonbleed water-based ink blends easily. Create subtle color washes by dipping brush tip in water. Check out the other pages under TIPS & TOOLS at the top of the page. There’s lots more to see, and it will be updated frequently with your tips and suggestions. There are recommendations if you want to tangle on fabric, or add watercolor to your Zentangle-inspired art, as well as ideas for strings, and much more to come. And if you have information to share on tools you enjoy using with your Zentangles, or more tips on their use, please leave a comment or email me (linda AT tanglepatterns DOT com] and let me know so I can add them to this resource for everyone’s enjoyment. Thanks! 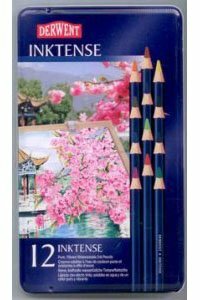 I have the Derwent Art-Tense Ink Pencils. 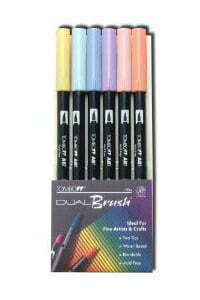 I do a lot of watercolor painting and these bring out a vibrancy, enabling your artwork to jump off of the paper. Since starting with Zentangling, working with white & black, coupled with shading, the magnitude of results, are without a doubt..’AMAZING’. Treat yourself, they are a little pricey, however the quality of results are well worth it. I’m a newbie – appreciate these pages and all the other great info online. My question: What do people use to for “filling in” sections of their zentangles. Does anyone use Micron brush pens? Other suggestions? Hi Linda, and welcome! I’m assuming that by “filling in” you’re referring to any solid areas? If that’s the case, I often use the larger nib Sakura Microns (02, 03, 05, 08) depending on how big the area is that I want colored in. Occasionally I use the Micron Graphic 1 that comes in the multi-pack set. I haven’t purchased any Brush pens because the ones I have seem to do the trick for me. I imagine if you’re working in a format larger than the 3 1/2″ square tile the Brush pens could come in handy. Maybe another of our Gentle Readers can help out here?